Need some ideas for some upcoming holiday parties? Whether you are up to a fun game night with friends, a casual family get-together or a girl's night out, I've got an outfit for you! 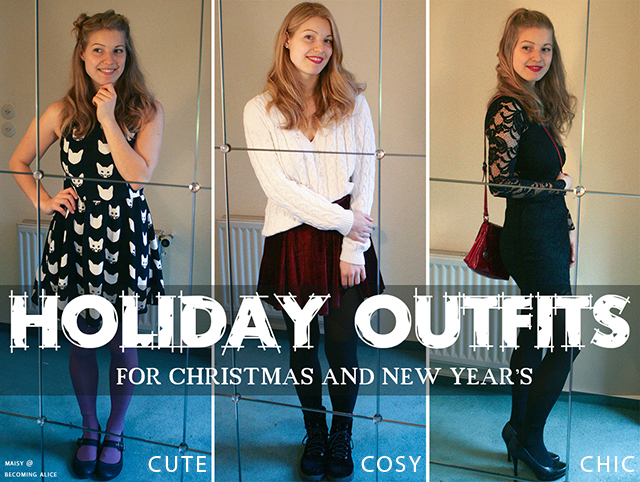 And let me know what you think of my outfit ideas! First the "adorkable" look. 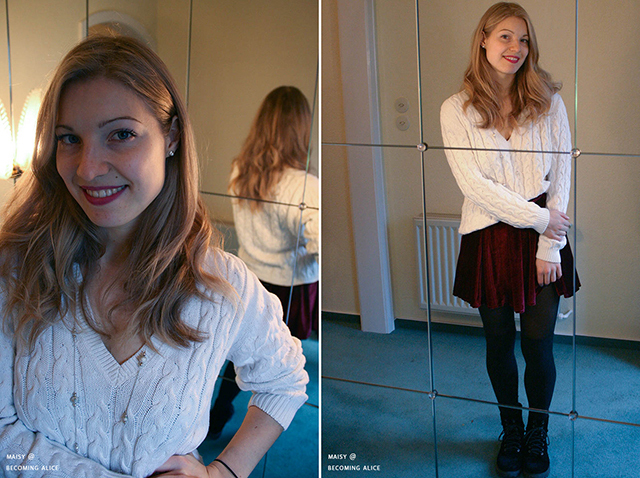 A mix of casual and quirky, stylish but still comfy. Basically: me in a nutshell. 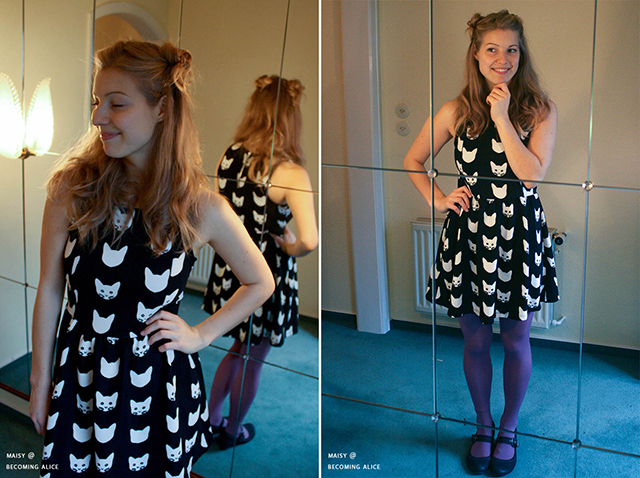 For this outfit I went for a patterned cat dress (who is reminded of the super annoying song "cat face" by this? 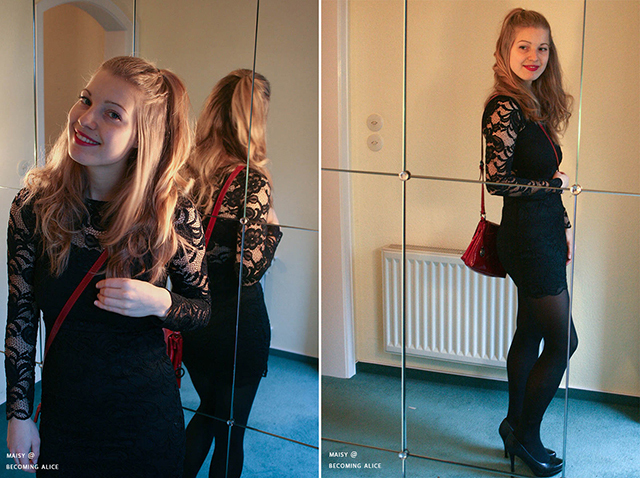 !...just me then) which has been my go-to New Year's party dress for the past 3 years, purple tights (any quirky colourful tights will do), simple black Mary Janes for that girly touch, and space buns (!). 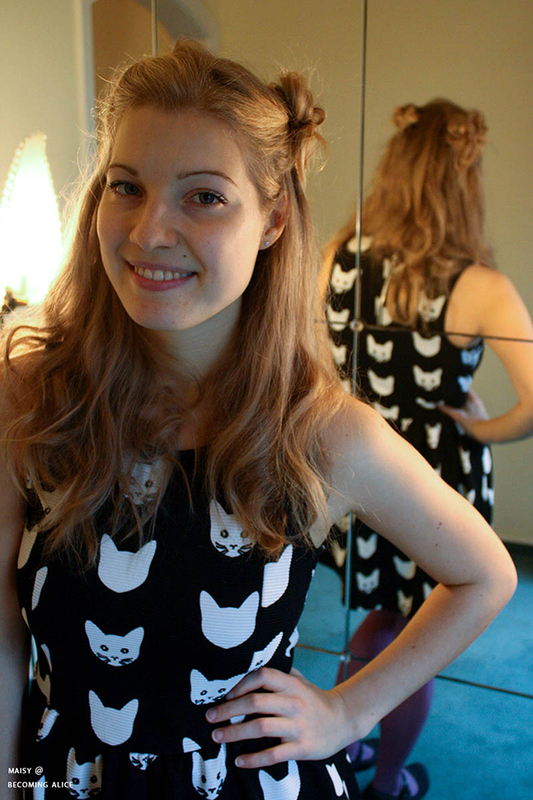 Think of these what you want, but the space buns are essential for this look, a) because they sort of resemble cat ears, and b) because they are just simply fun and cute. Here's the tutorial that I followed for the space buns (3:18). Doesn't this burgundy velvet skirt instantly make you think of Christmas time? It's the perfect wintry skirt that you can either dress up with a nice top and some heels for a night out or dress down with a casual sweater and some booties for a cosy day with your friends or family, which is what I did here. The gorgeous deep burgundy red of the skirt is contrasted by a loose cream-coloured knitted sweater, which I paired with a festive necklace, pearl earrings, black tights, black knitted knee socks and black velvet boots. 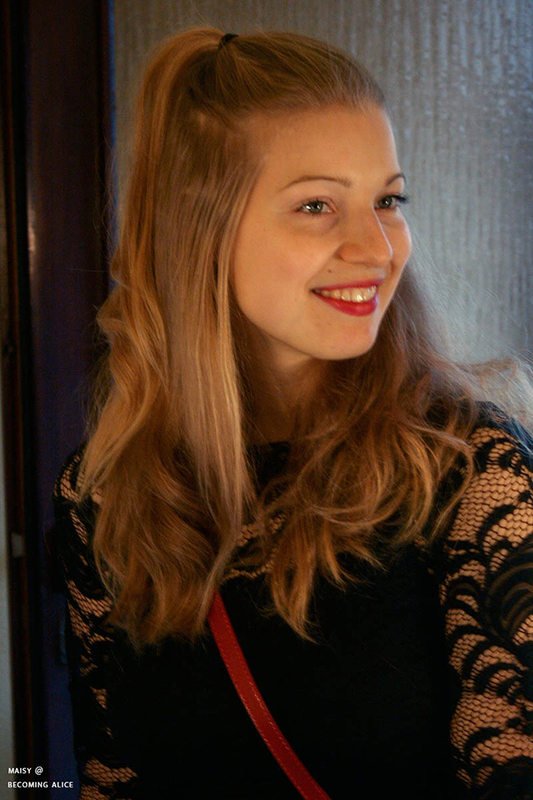 As always, I kept my make-up super minimal and only accentuated with some velvety red lip-liner on my lips. Last but not least, the most dressy of the three. This outfit is perfect for a night out, a fancy cocktail party or a romantic candle-light dinner with your love. Simple but effective, I centred this look around a black fitted lace dress with a beautiful "open" back - a bright red lace dress would look stunning as well! I finished off the look with black high-heels, half-up half-down hair, a bright red purse and - of course - a classic festive red lip to balance out the black. So, my friends, I hope at least one of these outfits was somewhat of use for you.